With a tradtional country house design crafted from solid oak and oak veneer that is lacquered to enhance the natural grain. The traditional shaker design is perfect to complement any dining room. 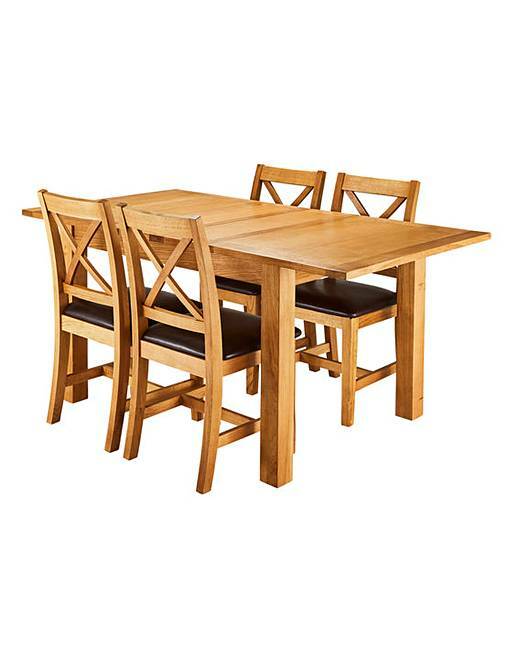 Save when you buy the Harrogate Oak and Oak Veneer 5-piece dining set.This dining set features large extending dining table with hidden extention leaf, table can extend from L.120 to L.170cm. Complemented perfectly by 4 Harrogate dining chairs with cushioned faux-leather seats and a ladder back. Minimal assembly required. Chair maximum user weight of 17st/110kg.